Cinematic and page-turning, a twisty, compulsively readable new novel about one woman's complicated relationship with her mother-in-law that ends in death. From the moment Lucy met her husband's mother, Diana, she was kept at arm's length. Diana was exquisitely polite, and properly friendly, but Lucy knew that she was not what Diana envisioned. But who could fault Diana? She was a pillar of the community, an advocate for social justice who helped female refugees assimilate to their new country. Diana was happily married to Tom, and lived in wedded bliss for decades. Lucy wanted so much to please her new mother-in-law. 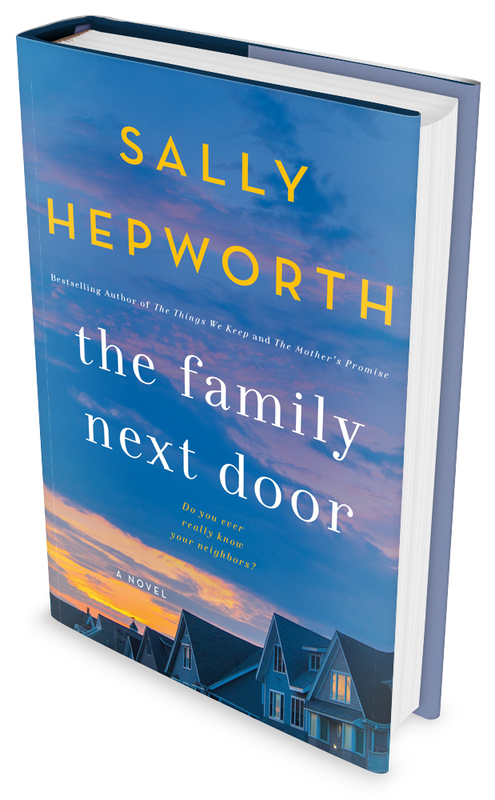 With Lucy's secrets getting deeper and her relationship with her mother-in-law growing more complex as the pages turn, this new novel from Sally Hepworth is sure to add to her growing legion of fans. Sally Hepworth is the bestselling author of The Secrets of Midwives, praised as “enchanting” by The Herald Sun, “smart and engaging” by Publishers Weekly, and heralded by New York Times bestselling authors Liane Moriarty and Emily Giffin as “women’s fiction at its finest” and “totally absorbing.” The Secrets of Midwives was the highest selling debut Australian fiction of the year in 2015. Sally lives in Melbourne, Australia with her husband and three young children. To be published in 2019 by St. Martin’s Press in the US and Canada, Pan MacMillan in Australia, and Hodder & Stoughton in the UK. The Secrets of Midwives follows three generations in a family of midwives — mother, daughter, and grandmother — and the secrets of their pasts that are revealed when the youngest unmarried daughter reveals she herself is pregnant. Neva Bradley is a third-generation midwife living in Boston. A natural introvert, she’s never courted attention like her flamboyant mother, nor become a trailblazer like her grandmother. So when she finds out she’s pregnant, Neva decides to keep the news a secret from her family and coworkers. But she soon realizes that even the bulkiest sweater isn’t going to keep her news hidden forever. She’s going to have to admit she’s pregnant…and reveal the identity of the baby’s father. Grace, Neva’s mother, craves the passion and attention her daughter shies from. But her once-hot relationship with her husband is sputtering, and her own daughter barely tolerates her. When Neva announces her pregnancy — and refuses to reveal the baby’s father — Grace finds herself a challenge that just might add some excitement to her dreary life. Then there's Floss, Neva’s grandmother, a retired midwife enjoying a new relationship, the first authentic one of her life. But when her granddaughter reveals the mysterious nature of her pregnancy, Floss is thrust back 60 years in time to a secret that eerily mirrors her granddaughter’s — a secret which, if revealed, will have life-changing consequences for them all. Will these women reveal their secrets and deal with the inevitable consequences? Or are some secrets best kept hidden? Published by St. Martin's Press in 2015. Anna Forster is only thirty-eight years old, but her mind is slowly slipping away from her. Armed only with her keen wit and sharp-eyed determination, she knows that her family is doing what they believe to be best when they take her to Rosalind House, an assisted living facility. But Anna has a secret: she does not plan on staying. She also knows there's just one another resident who is her age, Luke. What she does not expect is the love that blossoms between her and Luke even as she resists her new life. As her disease steals more and more of her memory, Anna fights to hold on to what she knows, including her relationship with Luke. Eve Bennett, suddenly thrust into the role of single mother to her bright and vivacious seven-year-old daugher, finds herself putting her culinary training to use at Rosalind house. When she meets Anna and Luke, she is moved by the bond the pair has forged. But when a tragic incident leads Anna's and Luke's families to separate them, Eve finds herself questioning what she is willing to risk to help them. Eve has her own secrets, and her own desperate circumstances that raise the stakes even higher. Published by St. Martin’s in 2016. With every book, Sally Hepworth becomes more and more known for her searing emotional portraits of families―and the things that test their bonds. In The Mother’s Promise, she delivers her most powerful novel yet: the story of a single mother who is dying, the troubled teen-aged daughter who is battling her own demons, and the two women who come into their lives at the most critical moment. Alice and her daughter Zoe have been a family of two all their lives. Zoe has always struggled with crippling social anxiety and her mother has been her constant and fierce protector. With no family to speak of, and the identity of Zoe’s father shrouded in mystery, their team of two works―until it doesn’t. Until Alice gets sick and is given a grim prognosis. Desperate to find stability for Zoe, Alice reaches out to two women who are practically strangers, but who are her only hope: Kate, her oncology nurse, and Sonja, a social worker. As the four of them come together, a chain of events is set into motion and all four of them must confront their sharpest fears and secrets―secrets about abandonment, abuse, estrangement, and the deepest longing for family. Imbued with heart and humor in even the darkest moments, The Mother’s Promise is an unforgettable novel about the power of love and forgiveness. Published by St. Martin’s in 2017.